Unit Rules, Code of Practice & Protocols. 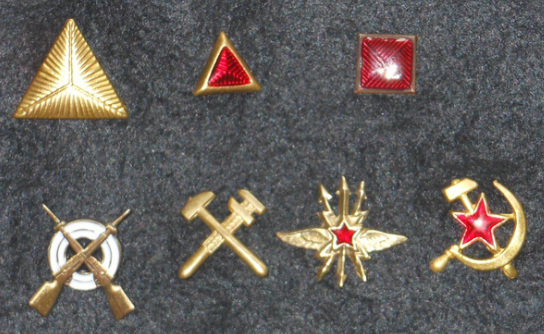 Soviet branch of service and rank insignia. Following the formation of the Workers and Peasant Red Army (Raboche Krest'yanskia Krasnaya Armiya or RKKA) in 1918, the titles and ranks associated with the former army of the Tzar were abandoned. Positional titles rather than rank titles were adopted to describe the various roles performed at all levels within the Red Army, ie Section Commander, Company Commander, Battalion, Regiment, Brigade etc up to the highest level. It was also often difficult to distinguish the fighting man from the commander, particularly in the field, due to minimalistic insignia. 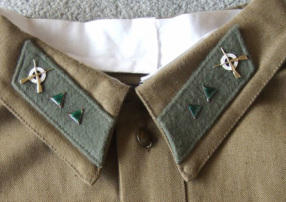 Between 1935 and 1941 new uniform regulatons authorised the insignia and ranks that were to be worn by the Red Army. This also included the reintroduction into the army of the ranks of General and Lt. Colonel in 1940. The rank of Yefreitor (Corporal) was also reintroduced in the same year. NOTE: AS THE 13TH GUARDS ARE A RIFLE (INFANTRY) UNIT, THE INFORMATION CONTAINED HEREIN PRIMARILY RELATES TO RIFLE INSIGNIA ONLY AND THEREFORE DOES NOT EXTEND TO THE MANY OTHER ARMS OF SERVICE. ALSO, THE INFORMATION REFERS TO THE RANK INSIGNIA RELEVANT IN A RIFLE REGIMENT OR BATTALION, IE UP TO THE RANK OF COLONEL AND THEREFORE DOES NOT COVER THE RANKS OF GENERAL OR MARSHAL. In December 1935, Prikaz 176 authorised the issue of rank insignia to be worn on the new gImnastiorka and on the greatcoat. 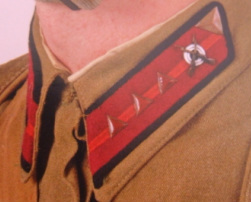 The branch of service and rank insignia were to be worn on the PITLITSI collar patches and greatcoat gorget collar patches. Each Arm of Service had its own combination of coloured pitlitsi and branch of service emblem, ie a small metalic badge to be worn on the pitlitsi. Rifle colours were magenta (sometimes referred to as Raspberry Red) with black piping. Officers pitilitsi and greatcoat gorget patches were piped in gold and also wore on their uniform lower sleeves was a series of additional rank insignia in the form of chevrons. The Rifle insignia, a white enamelled target motif and overlaid by a pair of brass coloured crossed rifles was worn on both the pitlitsi and greatcoat gorget patches. Rank was distinguished by small brass and red enamelled devices in different forms ie, triangles for NCO's, squares for Junior Officers, rectangles for Field Officers and diamonds for Brigade, Divisional and Corps Officers. 1940 Rank Insignia and Subdued pattern. In May and July 1940, the 1935 rank insignia sequence was modified to include the rank of General to replace the functional ranks of Combrig, Comdiv Comcor and Comandarm and also the reintroduction of the rank of Lt. Colonel respectively. Also authorised to be worn on the 1940 NCO's pattern pitlitsi and greatcoat gorget patch, was a small brass triangular device on the upper corner and on the NCO's pitlitsi and gorget patch a narrow red cloth stripe. The stripe denoted the reintroduced rank of Yefreitor and the subsequent NCO's enamelled rank insignia were worn overlaying the red stripe. Following the combat experiences of the Red Army, particularly during the Winter War with Finland, in January 1941 steps to modify the uniforms for wartime conditions were undertaken. A subdued pattern was introduced and was intended to be implemented from October 1941 and through 1942. The pitlitsi and greatcoat patches were now a khaki drab colour and the rank insignia were also subdued, either a green enamalled or painted metal pattern. The metal branch of service insignia were often removed in the field. 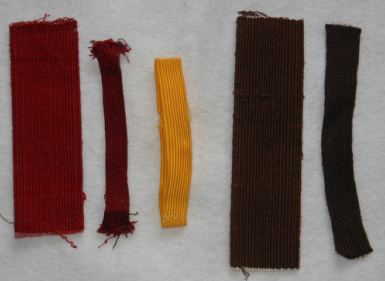 In August 1941 Prikaz 253 also abolished the sleeve rank chevrons worn on officers uniforms cuffs at that period, although many officers continued to wear them during the first year of the war. The subdued pattern was still being introduced at the time of the German invasion of the Soviet Union and both the Obr 1935 and 1941 insignia were seen in the field during the first year of the conflict. 1940 Pitlitsi and Greatcoat gorget patches rank insignia. Note: Enlisted men's pitlitsi were piped in black and on the upper edging of the greatcoat gorget patch. Officers also had gold coloured piping on the pitlitsi and on the upper edging of the greatcoat gorget patch. Sgt Majors also had additional gold coloured piping on the pitlitsi and great coat gorget patch. 1941 Subdued Pitlitsi and Greatcoat gorget patches rank insignia. Note: In the field the metal branch of service badges were also often removed. 1940 NCO's gImnastiorka pitlitsi.Note the addition of the brass triangular device and red stripe. 1941 subdued pattern pitlitsi. The branch of service insignia was often removed in the field. In January 1943 Prikaz 25 authorised the issue of new uniforms for the Red Army and the reintroduction of the POGONII shoulder boards. The shoulder boards again came in a combination of various colours for each Arm of Service and a metal branch of service badge was also worn on it. However, Rifle and Administrative personnel did not wear the metal branch of service insignia on their shoulder boards. Field boards were of a khaki coloured material piped in Arm of Service colours, ie magenta for Rifle units. Rank insignia took the following form on the shoulder boards. 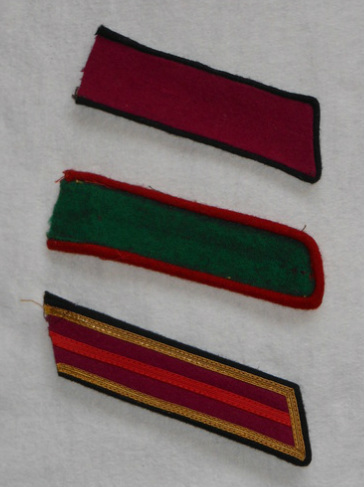 For NCO's a series of claret coloured cloth transverse bars was worn across the boards. Officers boards were also of a khaki coloured material and piped as above, braided for General and Marshal ranks. For Junior officers i.e. Jnr Lieutenant to Captain, a single claret coloured bar ran the length of the board and a series of either subdued metal or silver coloured stars indicated the rank. For Field Officers i.e. Major to Colonel, two claret coloured bars ran the length of the board and a series of slightly larger stars, as described above, indicated rank. In none combative arms NCO's rank bars were brown coloured and the bars on officers shoulder boards were also in brown and the Officers board was of a narrower design i.e. Medical, Veterinary, Judicial and Administrative Services. SERVICE OR WALKING OUT BOARDS. On Enlisted men and NCO's Service boards, the entire board was in Arm of Service colour and piped in Branch colour ie, magenta board piped black for Rifle units. The NCO's rank insignia were a series of yellow/gold cloth transverse bars. The units identifying numbers were often stencilled on the Service boards Officers boards were made of a gold coloured braid material and both piping and bars were in service colours ie, magenta for Rifle units. The rank stars were silver coloured. In none combative, Commisariat and Technical branches the Officer's boards were of silver braid material with gold coloured stars. Note: Wartime regulations stipulated that the shoulder boards were manufactured from salvaged offcut materials, hence the often shoddy appearance, in particular the field boards. Shoulder boards were issued in four sizes i.e. 13mm,14mm,15mm and 16mm in length respectively. 1943 Field Pogonii rank insignia. Obr 1943 Branch of Service insignia. Metal Branch insignia that would have been worn on the 1943 shoulder boards. Colonel Rifles field pogonii shown for comparisson with non combatants officer boards. Snr Lieutenant Medical Services field pogonii. Medical, Veterinary, Judicial and Administrative Services Officers wore the narrow type shoulder board. Enlisted man Rifles Service pogonii. Pitlitsi: Top, Rifle troops. Centre, Border Guard troops. Bottom,Rifle troops (Sgt Major). Top: Pitlitsi rank insignia. Left, Brass triangular device worn by NCO's (introduced in 1940). Centre, NCO's rank insignia-triangle. Right, Junior Officers rank insignia-square (Jnr Lieutenant to Snr Lieutenant). Bottom: Examples of Branch of Service emblems worn on the pitlitsi and later on the pogonii after January 1943. From left, Rifle & NKVD (after Jan. 1943). Technical Chemical, Signals & Commissariat troops (2nd pattern). Examples of shoulder boards: Top from left, Rifle, Armoured, Medical troops. Bottom from left, Sapper, Border Guards & Naval infantry troops (Baltic Fleet). 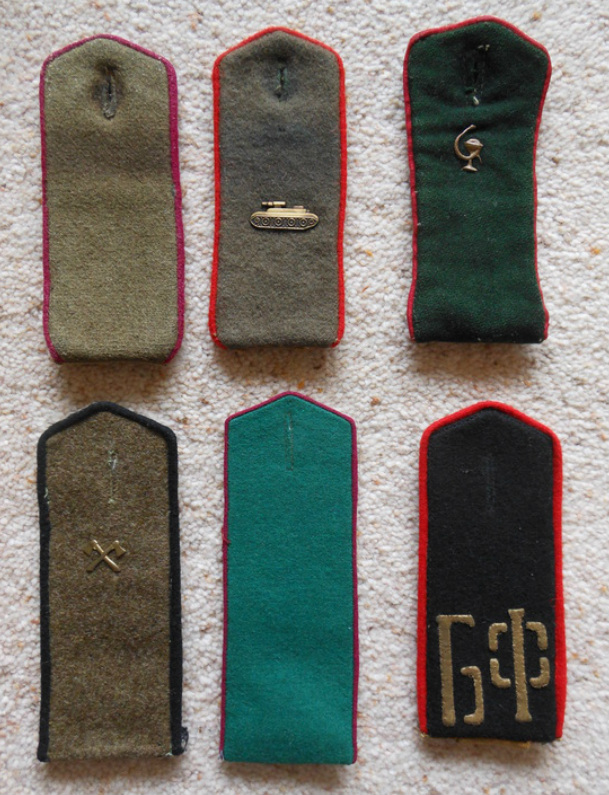 Starshina (Sgt Major) Shoulder boards. Left: Service/walking out. Right: Field order. 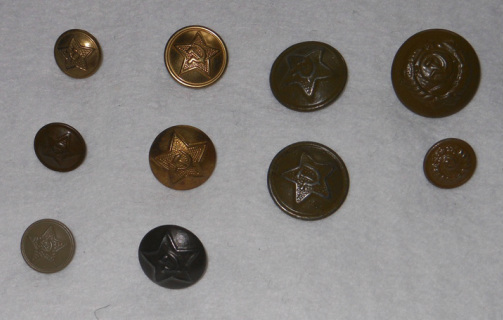 Examples of brass & subdued uniform buttons: From left, gimnastiorka, pogonii, subdued great coat pitlitsi-flat backed buttons & subdued great coat buttons for General & Marshal ranks (bearing the National Emblem of the Soviet Unit). Cloth transverse rank bars: which would have been stitched on the pogonii. 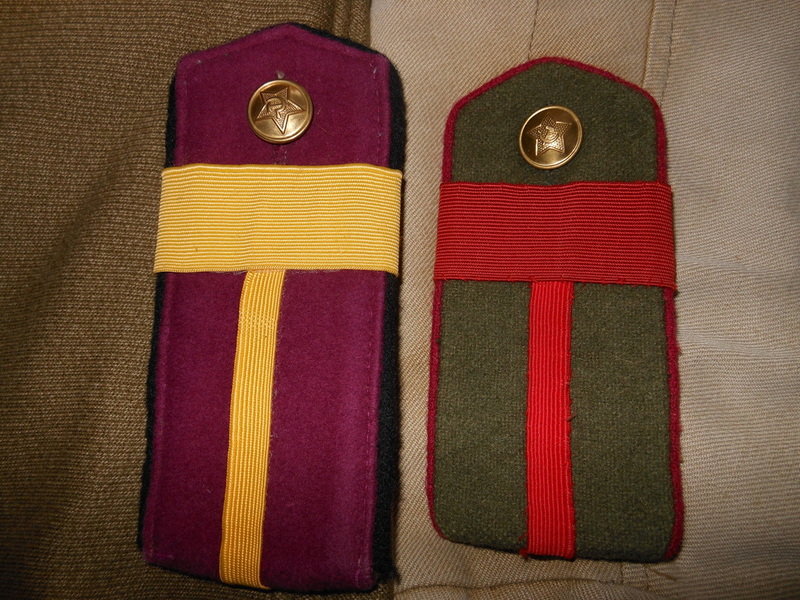 From left, Combat troops (Claret) - Snr Sgt, Corporal to Sgt rank bar, Corporal-Sgt yellow rank bar for Service Order pogonii, Non- Combat troops (Brown) - Snr Sgt & Corporal to Sgt rank bar. 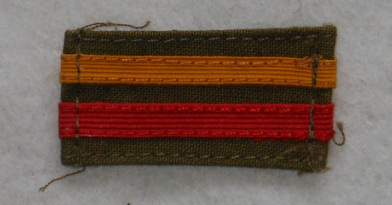 Coloured cloth bars were worn on the right breast of the gimnastiorka to signify wounds. A red bar signified a minor wound and a yellow bar a serious wound. The bars were worn an a khaki backing cloth and if the wearer had numerous injuries the serious wound bars were worn uppermost.